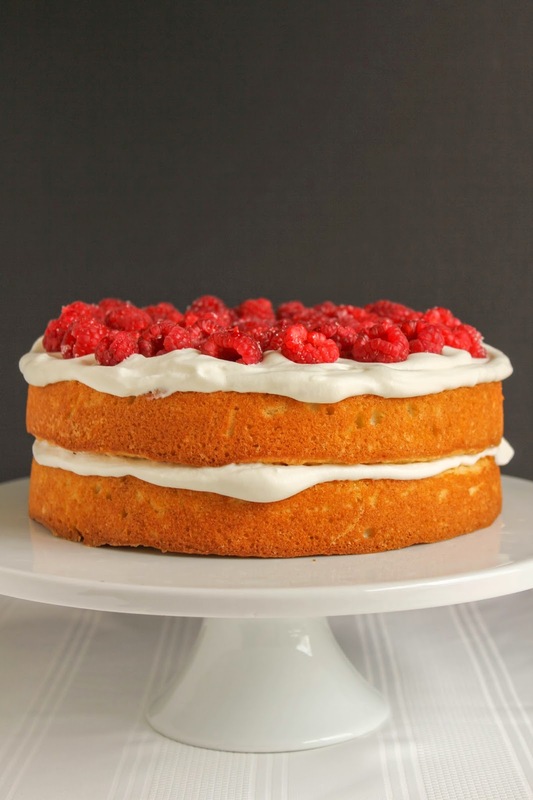 This super moist and flavorful raspberry cake is topped with homemade whipped cream and fresh raspberries. I was looking for a simple but beautiful dessert to serve on Memorial Day. I wanted something light and fresh, and of course delicious. Although I love chocolate, I didn't want a chocolate dessert this time around. The cake I ended up making was perfect. Simple to make, super moist and tender, and extremely bright. Homemade whipped cream and fresh raspberries pulled the whole thing together. This cake is gorgeous and will please your family and friends for sure. It's the perfect ending to your next barbecue or family gathering! Preheat the oven to 350 degrees. Spray two round baking pans with baking spray and set aside. In the bowl of a stand mixer, beat the butter and sugar on medium speed until light and fluffy. Add the eggs, one at a time, beating well after each addition. Beat in the vanilla and almond extracts. Whisk together the flour, baking powder, and salt in a small bowl. Add the dry ingredients to the mixer alternately with the milk, beating well after each addition. Pour the batter evenly into the prepared pans. Bake for 35-40 minutes, or until a cake tester inserted into the center of the cakes comes out clean. Let the cakes cool in the pans on a wire rack for 20 minutes, then remove them from the pans and allow to cool completely on the rack. When the cakes are completely cooled, make the whipped cream. Add the sugar, vanilla, and whipping cream into the bowl of a stand mixer using the whisk attachment. Start the mixer on low, then turn it up to high and whip until the cream reaches stiff peaks. Place one cake on a platter or cake stand. 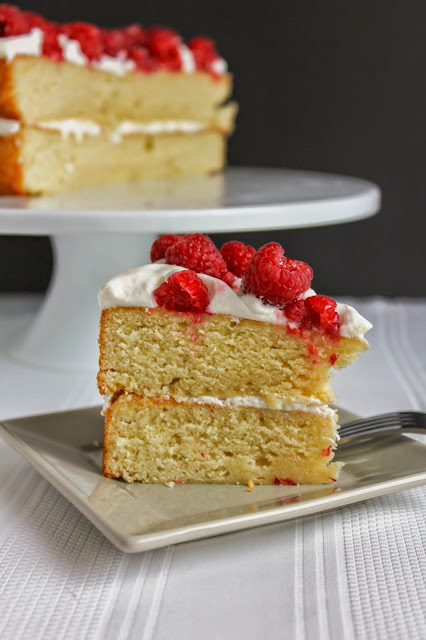 Pour almost half of the whipped cream onto the center of the cake and gently spread it all over with a knife. Place the second cake on top of the first, pressing down gently. Add the remaining whipped cream and spread it evenly all the way to the edges. 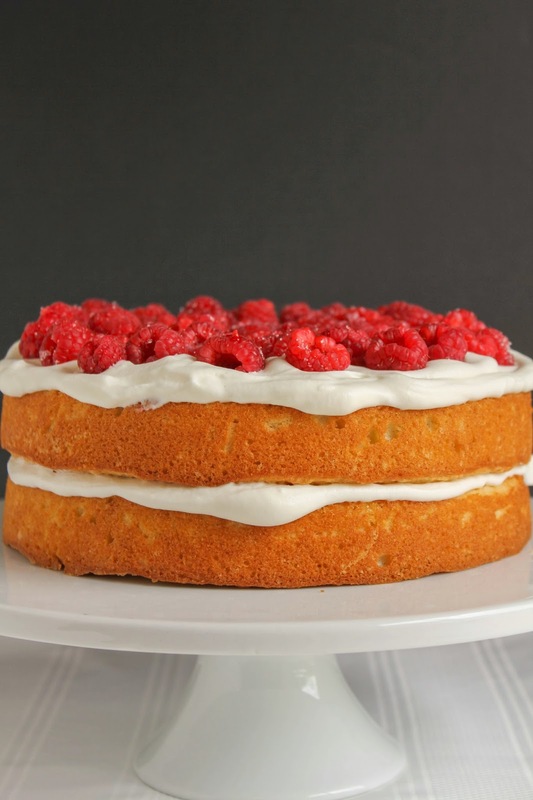 Place the raspberries all over the top of the cake. Slice and serve. Leftover cake should be kept covered and stored in the refrigerator.